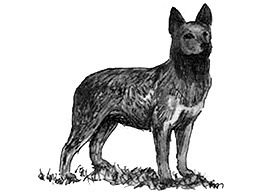 Shall be that of a well proportioned working dog, rather square in profile with a hard-bitten, rugged appearance, and sufficient substance to convey the impression of the ability to endure long periods of arduous work under whatsoever conditions may prevail. The Stumpy is ever alert, watchful and obedient, affectionate and responsive to its owner, but reserved towards strangers. At all times it must be amenable to handling in the Show ring. The skull is broad between the ears and flat, narrowing slightly to the eyes with a slight but definite stop. Cheeks are muscular without coarseness. The foreface is of moderate length, well filled up under the eye, the deep powerful jaws tapering to a blunt strong muzzle. Nose black, irrespective of the colour of the dog. The eyes should be almond in shape, of moderate size, neither full nor prominent, with alert and intelligent expression, and of dark brown colour. The ears are moderately small, pricked and almost pointed. Set on high yet well apart. Leather moderately thick. Inside the ear should be well furnished with hair. The teeth are strong, sound and regularly spaced. The lower incisors close behind and just touching the upper. Not to be undershot or overshot. The neck is arched, sinewy, of exceptional strength, and muscular. Neck of medium length, broadening to blend into the body, free from throatiness. The shoulders are clean, muscular and sloping with elbows parallel to the body. The forelegs are well boned, muscular and straight when viewed from either the side or front, with very strong flexible pasterns. The length of the body from the point of the breast-bone to the buttocks should be equal to the height of the withers, ensuring the dog is square in profile. The back is level, broad and strong with deep and muscular loins, the well sprung ribs tapering, to a deep moderately broad chest that flows into a slightly tucked up flank. The hindquarters are broad, powerful and muscular, with well developed thighs, stifles moderately turned. Rear pasterns are strong, moderately let down with moderate angle of hock. When viewed from behind the hind legs from hock to feet are straight, and placed neither close not too wide apart. The feet should be round, strong, deep in pads with well arched toes, closely knit. Nails strong, short and of dark colour. The tail is undocked, of a natural length not exceeding 10 centimetres (four inches), set on high but not carried much above the level of the back. Soundness is of paramount importance. The action is true, free, supple and tireless, the movement of the shoulders and forelegs in unison with the powerful thrust of the hindquarters. Capability of quick and sudden movement is essential. The outer coat is moderately short, straight, dense and of medium harsh texture. The undercoat is short, dense and soft. The coat around the neck is longer, forming mild ruff. The hair on the head, legs and feet, is short. Blue - The colour should be a good even Blue Mottle or Blue Speckle, with or without black marking on the head and body. Blues should not have a red undercoat or any appearance of red throughout the coat or head. Tan - Irrespective of the colour of the dog, Tan markings are not permissible in either the Blue or Red dogs, under any circumstances. Loaded or slack shoulders or straight shoulder placement. Weakness at elbows, pasterns or feet.